I saw this recipe in Saveur, I'm not totally sure what month. I'm always looking for good ways to cook cheap cuts of meat, and lamb shoulder is fairly inexpensive and there just don't seem to be a lot of recipes that call for it. This is super easy, and real good. From Saveur, scaled down for two and with some other changes. You can use whatever vegetables you have on hand, I would have liked some carrots in there. Preheat oven to 325. Sprinkle salt and pepper on the lamb and set aside. Toss the vegetables with the olive oil, and spread in the pan. 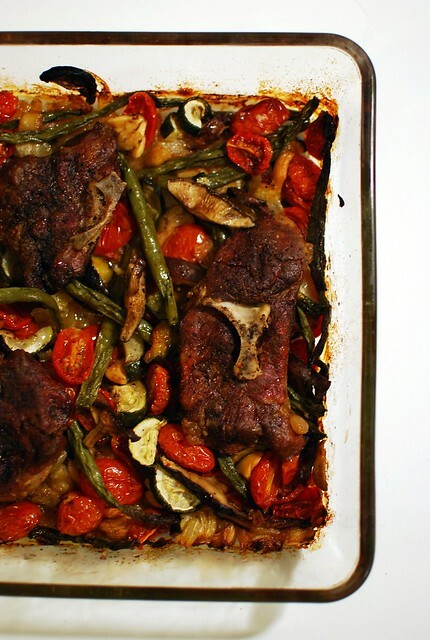 Snuggle the meat down into the vegetables, cover, and bake an hour. Remove the foil, and continue cooking until the lamb is tender, about another hour. Serve over polenta or rice or as is. Can you come live with us and cook for us? I made lamb shoulder roast last week that came out really good. 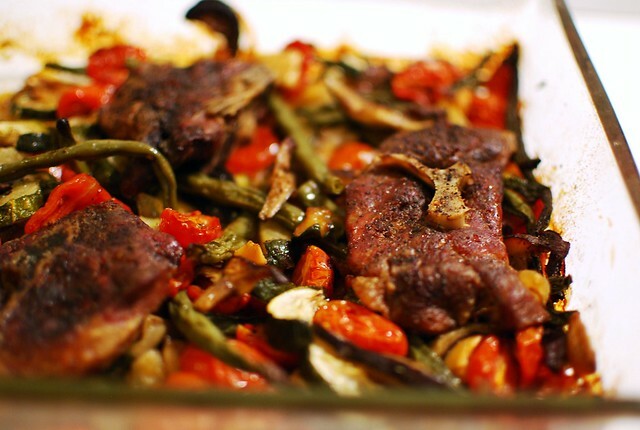 I had problems finding recipes too and kind of cobbled one together that worked out to be very tasty and tender. Though I'm not sure I want to make a lamb shoulder roast again simple because of how much bone was in the cut. I'm sorry, heaven called, they want their dinner back! This looks amazing!